Moody ol' bugger, aren't you? Wesley Sneijder mentioned before the match that the Dutch side need to get rid of their “pathetic egos” inside the camp, but it seems like his words were not heard by one of his teammates. 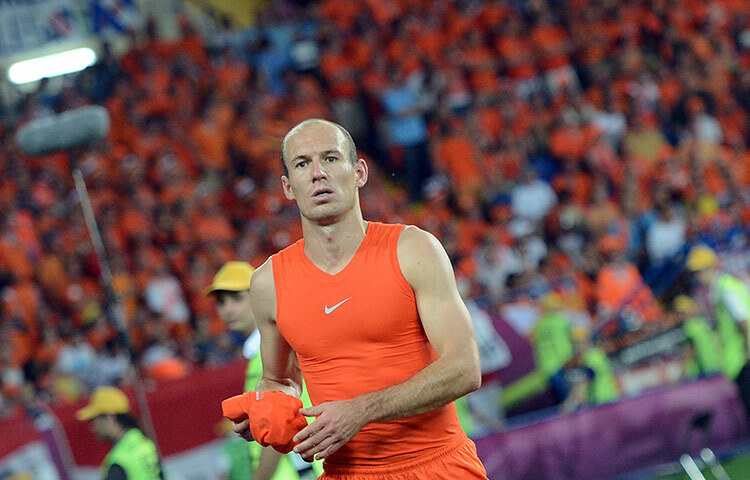 Robben, who was pretty predictable during the game, was substituted off around the 70 minute mark for Dirk Kuyt. Instead of tagging his teammate in, he walked off the other side of the pitch in disgusting, removing his jersey and sitting like a moody kid once he reached the dugout. I omitted him from the SFG Team of Round 1 and realised it was a mistake afterwards. I doubt I will be making the same mistake next time due to his solid performance. Not only did he nullify the Dutch attack on a number of occasions, but he also managed to run to the other side of the field and force two excellent saves from Dutch keeper Maarten Stekelenburg. He did deserve a goal for his performance, just a shame he didn’t get it. One of our players to watch in this tournament, the young Dutch left-back had a decent first game, but was absolutely bullied in tonight’s match by Muller. Not only was he caught out of position so many times during the first half, he also committed a few fouls. Aside from picking up a yellow card in the last 45 minutes, Willems’ 2nd half performance was much stronger than his 1st. He made quite a few crucial tackles which kept his side in the game. He will be up against Nani/Ronaldo, hopefully his performance will be much better than what was witnessed in this game. One game remains, the Germans only need to secure a point; Denmark and Portugal preferably need a win to qualify; and Netherlands need a win to even stand a chance of progress to the knockout stages. Netherlands go up against Portugal, but a win will not guarantee progression, especially if it’s insufficient in terms of goals scored or if Denmark pick up at least one point against Germany. The orange kit-wearers will be hoping their rivals can beat Denmark (preferably by a substantial amount) in order for them to go through, assuming they beat Portugal. But this is a huge ask, especially from their rivals. Either way, Netherlands need to go out and win, instead of sulking.